Your home is essentially an expression of your style similarly the colours, designs and mood you want to set in your home will be unique to you. Apart from the shape, style or material, colour is an integral as well as a vital part of your décor because it creates an overall mood be it calm, cheerful or dramatic. Colour psychology says that though people are attracted to some colours or look good in a dress of a particular colour, doesn’t mean that the same colour will look good in their décor. In fact, there are certain guidelines you need to follow to get a desired or professional look for your interiors. These sure shot ways will aid in getting you the right colour scheme or setting the right mood for your home. Meaning: Colour of the sky, sea and earth, blue is associated with depth and stability. It denotes trust, loyalty, wisdom, confidence, intelligence, strength, dependability, faith, and truth. Mood: Blue is scientifically proven to have a calming effect on your mood as well as makes you feel relaxed, soothing and more centred. It improves productivity and builds confidence. It creates a sense of cooling and gives a clear look. Since it is associated with tranquillity and calmness, it is beneficial to the mind and body. Employ blues to create an atmosphere of personal space and meditation. How to use blue in your Interior: Blue tends to enlarge the room with the use of a very light shade. If your space is exposed to sunlight you can use this colour to cool a room. For instance, aqua blue velvet sofa looks fabulous in a contemporary setting and tones down the harsh sun rays. The beauty of blue lies in its amazing versatility. A high-energy shade of blue, like sapphire or royal blue, can add a bold punch of energy to a room, while a light sky blue can make a space feel tranquil. Darker shades like navy can offer drama and relaxing nautical vibe, while electric blue is often more energizing than calming. The effect depends on the tone of blue. The combination of blue and white in your décor can feel refreshing and fun. Vibrant, high-tone blues are great for accent furniture pieces or artwork to add vigour. Meaning: Red is an intense colour associated with energy, war, danger, strength, power, determination as well as passion, courage, desire, and love. Mood: Red increases enthusiasm, stimulates energy, passion and strong emotion. It boosts action, confidence and appetite. 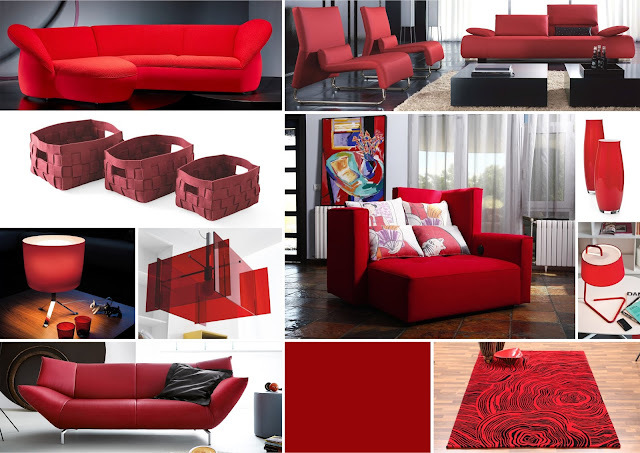 How to use red in your Interior: Red is a powerful colour that brings out the best in your décor. It’s best used as accent but using a red sofa in your décor makes a powerful statement that relates to dominance or authority. If you’re using a red sofa make sure that it is juxtaposed to a wall colour that’s white or black but not same colour. If there is no contrast, it will make your room look monotonous than bringing out the colour essence or the meaning you want to display. Using dark red in your interior exhibits daring, bold, willpower and commands attention whereas a light red represents passion and sensitivity. Red also goes well with black but the ratio should be fixed to an extent that you feel it is not too noisy or loud. Red can be combined with browns or light colours to achieve elegance and energy as well as the retro vibe. If not the sofa, big chairs and drapery can display red to make your space more inviting. While an earthy red used with wood tones can warm a room, a red with soft gray and touches of magenta or orange can make a room feel cosy, feminine and soft. Depending on the texture, deep reds may absorb light while brighter reds allow light to bounce off walls and illuminate the space. Though its versatility makes it a vital among other colours, red can feel contemporary, traditional, rustic or timeless, depending on the shade and context. Meaning: Colour of the sunshine, yellow is an uplifting hue. It is associated with happiness, optimism, joy, intellect, and energy. Mood: Yellow is a mentally stimulating colour. It produces warming effect and arouses cheerfulness. It stimulates the nervous system, activates memory, encourages communication and promotes creativity. 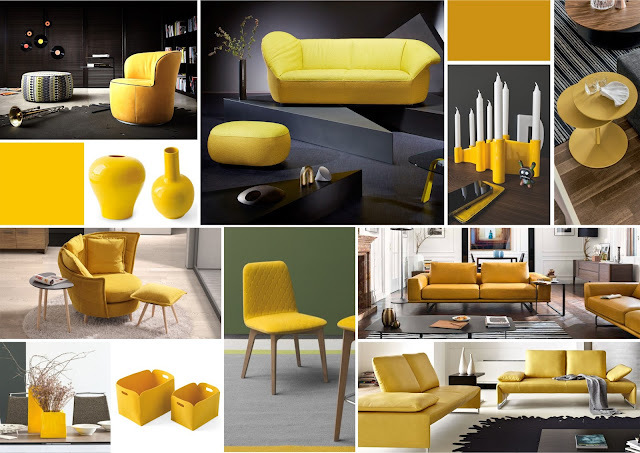 How to use yellow in your Interior: Yellow is effective for grabbing attention, hence using it to highlight an important element in your design or space is important. Using light yellow furniture with light colour wall paint will make it disappear into the background, while using a dark tone will bring a balance in your space. If you’re using a dark yellow furniture or sofa, tone it down with white accent or white wall paint. Using muted yellow will make you feel relaxed, peaceful, and airy as well as give you a bonus of making your space appear large and spacious. Adding yellow accent or accessories in your foyer or space offers a fresh appeal and optimism. You can add a splash of yellow colours in your décor by using Koinor and Natuzzi sofas and brighten up your space. Effects of yellow colour vary with its nuances. Yellow is a great colour for rooms that have more exposure to sunlight. A darker yellow element may be damper after a while but a pale yellow can make a compact room feel larger. Use of smaller amounts of yellow in accessories, flowers or pictures can make your space stand out. The wide spectrum of yellow shades gives you flexibility in designing rooms with a feel-good ambiance. Meaning: It is associated with friendship, tranquillity, warmth, affection, feminine, tenderness, harmony, inner peace, and approachability. 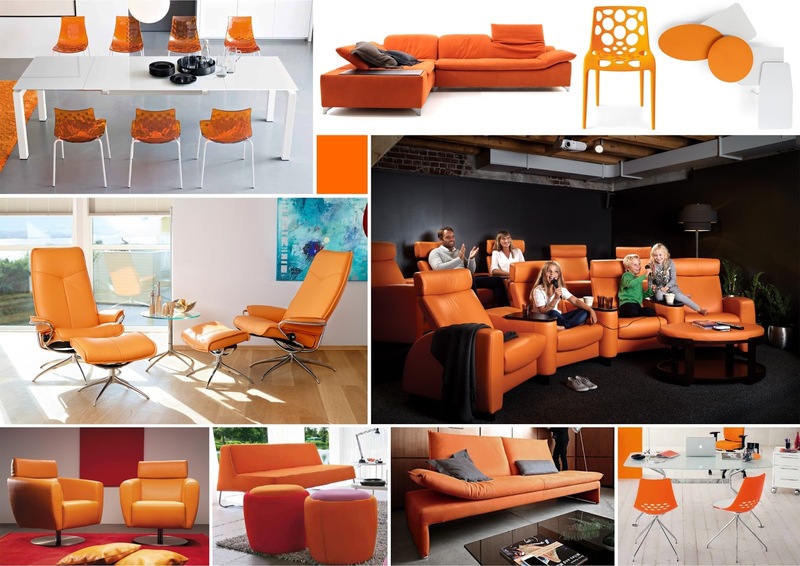 Mood: it is a very comforting colour and is favoured by many for its childlike appeal. It brings about serenity, peace, relaxation, acceptance, contentment and satisfaction. 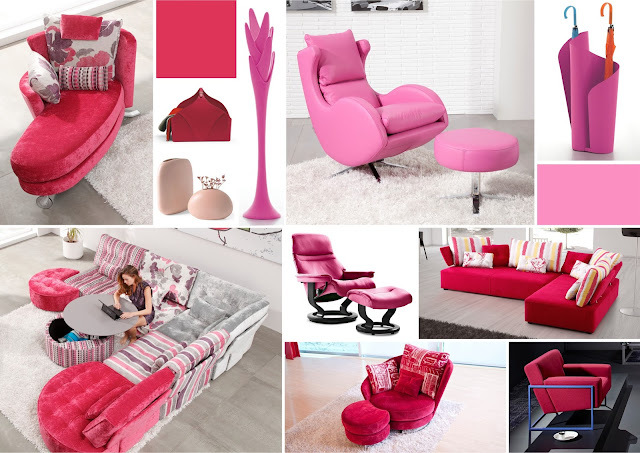 In general, used in interior design, the psychological effects of colour pink is soothing and comfortable. How to use pink in your interiors: pink can be used in a number of ways to uplift a space and doesn't have to be a colour that dominates the room. For instance, with a sofa like Fama’s Arianne love the entire space is giving a bright and calm look. You can use pink colour to create a fresh and fine atmosphere in the house. A bright, vivid tone like fuchsia suggests energy and glamour. A soft and restrained pink, like blush, or beige with pink undertones creates a soothing feeling. If you ever think of having white painted walls, go for pink, it’s a flattering colour that makes people feel good and add energy to your home. You can use a more intense pink (like peony) for a space where you don't spend too much time, like your foyer. Pink can be paired with other colours, including chocolate brown, black, mint green, metallic gold and silver and white to create a variety of moods. When paired with a masculine hue like navy blue, pink can add a feminine balance. A light posy pink with a touch of gray can add innocence and sophistication to a room. Mix soft pinks with fresh greens for an inviting living room. A fabric pink sofa or a shaggy pink carpet makes your space feel comfortable. If used intelligently, pink can be a great addition to any home. Meaning: Greens represent a vast range of natural colours and appeal to many. Like blue, greens tend to calm and relax; it´s a healing colour. It symbolizes growth, harmony, freshness, and fertility. Green has strong emotional correspondence with safety. Dark green is also commonly associated with money. Green has great healing power. It is the most restful colour for the human eye; it can improve vision. Green suggests stability and endurance. Mood: It’s Soothing, and restful on the eye, relaxing mentally as well as physically, helps alleviate depression, nervousness and anxiety and offers a deep sense of renewal, self-control and harmony. How to use green in your interior: For interior colour schemes, olive and sage greens seem to be appealing because of their neutral character. Lighter shades of both are easy to live with for a long time. Both combine well with many colours. Dark greens are colours like burgundy, ruby, and sapphire blue. Chartreuse is one of those colours that delivers a big punch, but gets tiring quickly. Green immediately brings a fresh and rejuvenating feel to a room, whether it is a light and minty shade or deep and dark forest colour. Use the psychological effects of green colour to create a calm and relaxing atmosphere in your home. Green is very soothing to the eye and nature gives us a lot of nuances. 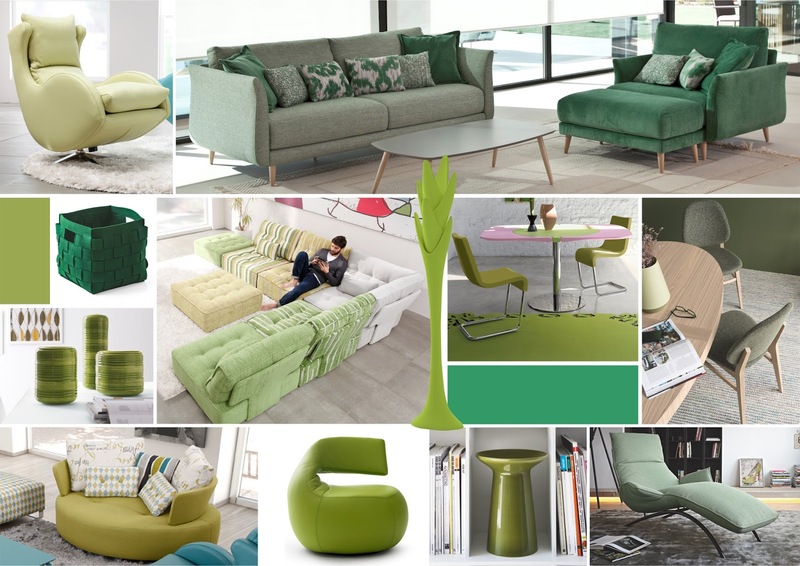 The best way to use green in the interior design is to combine several colours, or green combined with other colours. Green represents growth and renewal. You associate the colour with grassy fields, luscious leaves and other gifts of nature, so it lends a calming feel to a room. Celery green looks relaxing and warm in a living room. Pops of lime green add energy to a room with a mostly white palette. When paired with light gray, paler shades of green can create a contemporary look that feels fresh and clean. Mix green with wood tones to imbue a room with an organic, natural feel. Use citrus greens to bring brightness to a gloomy space. Use green in an entry hall to provide a natural link from the outdoors to the inside of your home. The soothing quality of green makes it ideal for almost any room. You can decorate an entire room with greens and have contrast, drama, richness and balance. READ ABOUT THE PSYCHOLOGY OF COLOURS IN INTERIOR DECORATION - PART 2 HERE. It’s that time of the year when winter collection is out on sale everywhere. You’ve bought new clothes and shoes to keep you warm, new curtains, heaters and so on. But, you’ll also need something for your cold floor that will not only keep your feet warm but an extra bonus for your décor. Carpets! Choosing the right carpet for your home is an important element in your décor that makes it not only appealing but complete. Here’s disclosing the secrets to purchasing the right kind of carpet for your home. Before going into details, knowing the types of carpets helps in defining the type you would like to have for your décor. Carpets can be distinguished based on their style and construction. Traditional Carpets: If you want a classical look to your décor, choosing traditional carpets like Persian and Oriental is a good idea. These carpets and rugs have intricate and artistic details that go back to 16th century. Even the Kilims and Daris fall under this category, which are characterized by flat woven without a pile. These are used as throw rugs and even across walls. Contemporary Carpets: These have a fresh modern look and can range from hand knotted to hand tufted that appear in silk and wool. Besides, shaggy carpets also come under modern style embossed with a grassy pile that’s soft and best enjoyed barefoot. These are crafted with various materials like wool, leather and polyester. Cut pile: All tufted carpets start out during the manufacturing process as loops. They’re made by twisting the carpet yarn tightly together, after which the loop is cut. These highly twisted yarns will hold its shape longer making it apt for high traffic areas in your space. More than anything, they get their durability from the fiber used, density of the tufts and the twist of the yarn. Cut pile is less resistant to crushing than other types of carpet. They are versatile and match all styles of homes. There are four popular styles to choose from: plush, textured, Saxony, frieze, and cable. Plush- Its appearance can be obtained by stapling yarns or twisting the yarns enabling the ends to blend together, enhancing the overall look. It’s smooth, soft, and silky with a luxurious finish. It creates a deep, soft feel underfoot and an effect similar to that of velour and velvet in looks. It’s best for low traffic areas and suited for formal areas like living room, bedroom. Textured- this construction is obtained by stuffing yarn into a steam box to get a kinked or curled yarn. These carpets are tightly twisted and have a multi-coloured look that disguises tracks and footprints. It uses low density fibers of uneven heights. It is not suited for high traffic areas. Saxony- This is a cut pile carpet which is similar to plush pile but with a higher pile height; and two or more piles of yarn twisted and steamed so that the tip of each carpet tuft is distinguishable on the pile surface. It is smooth, has refined surface and even finish. This carpet is ideal for living, dining and bedroom. Frieze- It is a highly coarse cut pile carpet that forms a curly textured surface because the yarns are extremely twisted. It has an informal look and is suited for high traffic areas. Its long and loose fibers help to hide dirt and footprints. A frieze carpet is a perfect choice for a well-used family room. Cable- This style of carpet is made with thicker and longer fibers to provide a cozy feeling when walked on. Loop Pile: This carpet has uncut yarn tips, making the loops visible. These loops are of the same height, creating an informal look. This style generally lasts a long time in high-traffic areas as they are resistant to crushing and matting. This type of carpeting is more casual and ideal for family rooms. Level loop- It is made by weaving even loops of yarn into carpet backing at both ends. It has a distinct textured loop finish created by a simple loop. This type of carpet is ideal for high traffic areas. Level loop piles with short and densely packed loops are easy to clean. They prevent dirt from filtering into carpet. Patterned Multi-Level Loop- this type of carpet has loops of varying heights to create a texture or pattern. It creates a casual or informal look making it suitable for family rooms. It is suitable for high traffic areas. Cut and Loop: This carpet style combines tufts of cut and uncut yarns. This means it is a mixture between cut pile and loop pile fibers. It offers a pile surface that is predominantly cut with loops forming a pattern or predominately loops with limited cut yarns to display a pattern. It has a textured appearance that is ideal for highly trafficked areas. As an added bonus, this type of carpet also hides dirt and stains. When cuts and loops are combined, you can create a wide range of patterns. This style offers both level and multi-level constructions. Berber: The loops are made from thick or bulky yarns of wool, nylon, polypropylene or a blend of these fibres providing high durability and a luxurious cushioned effect underfoot. They can be either level loop of multilevel loop. Berbers can have thicker yarns than other level loop pile carpets for high durability. Berber carpet is a durable yet modern carpet, which is great for use in high foot traffic areas such as offices and schools. Apart from the benefits, there are few questions you need to consider about your lifestyle. What are the rooms (bedroom, hallway, dining) in your house used for? 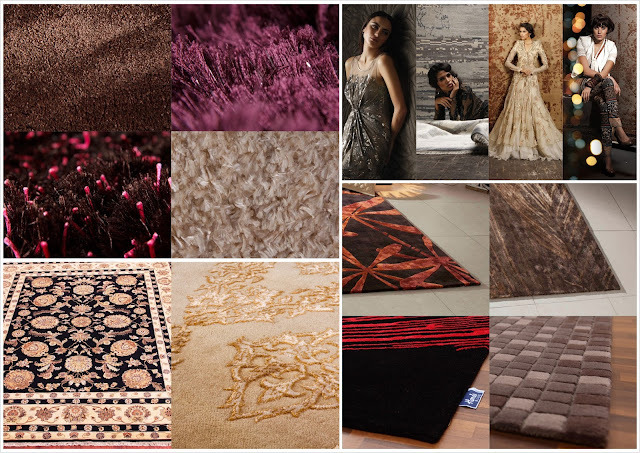 Do you want a carpet that blends in to your overall fashion design or one that makes its own fashion statement? How many rooms in your home do you need the carpet for? What is the traffic to each of these rooms? Does the room receive a lot of sunlight? How often do you clean or vacuum it? Answering these questions it will narrow down your search and help in determining the carpet for your home in terms of fiber as well as the texture, construction and colour. -If you’ve heard that carpets makes a room seem smaller, it’s certainly a myth because placing carpets actually enhances the size of your room, visually appealing to the eyes. -If you follow contemporary style, having plush, cut and loop pile, and shaggy ones look great. Also, a plush shiny carpets with some sheen adds glamour to your space. If your style is classic or traditional, then a Persian, Oriental, Kilims will be apt for your space. -The size of your carpet should be big enough to set boundaries and ground your furniture and make the room look spacious. For instance it should be large enough to at least accommodate the front legs of the furniture on it. Similarly, in your bedroom you need to feel the carpet under your feet when you get out of bed. -If you’re moving to a new place or decorating your room from scratch, then you need to choose a rug first and pick other elements that go well with it. -The level of traffic on your carpet will define the kind of usage of your carpet. More traffic means more danger of spillage, stains and dirt. Carpets are not recommended for kitchen due to heavy traffic and the nature of activities that happen in the kitchen. -If you have rooms with excessive exposure of sunlight, do not place your carpets there. Harsh sunlight may deteriorate the colour which is similar to any other accessories like drapes and mats etc. - Every room needs one main focal point. Your carpet can be that point or it can support another object such as a painting, crystal ware or piece of furniture. You just don't want the carpet competing, or your room will feel too busy and confusing. -Choosing the right colour for your carpet can put you in dilemma. 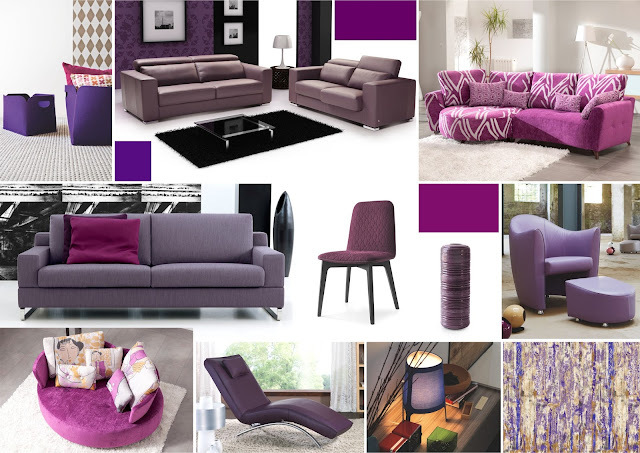 You’ll want to pick a colour that goes with the current trend or colour scheme or your decor. Neutral colours such as beige, black, brown or white go well with most of the décor setting. 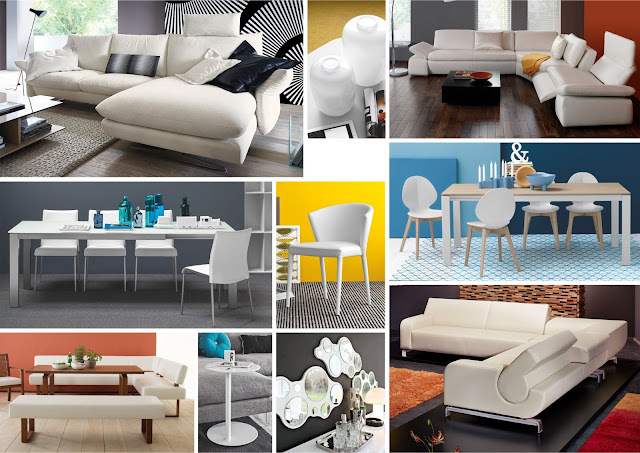 In addition, they are always safe except white, very calming and appealing in any room. Beige is considered safe by many designers. It is flexible and has an utilitarian value when it comes to protecting it from dust and dirt. Besides, your carpet need not match all your furniture or accessories in the room instead it could match at least the sofa pillows or drapes. Similar patterns and textures like that of your carpet in your decor is also a good choice. Complementary colours are great too and are hard to go wrong. The current trends are towards the much warmer colors like golds and greens. Earthy, environmental colors have become increasingly popular as well. Light blues, marcella, neutral stone hues, rosy quartz, khaki and suede shades are also very much in demand. Oriental reds and blues add intensity to any interior décor set-up yet carves a distinct space for itself. The most high-traffic area of your home should be layered with carpets in darker hues. To present an artistic and classy appeal to your décor, place a contemporary carpet with bright colours. 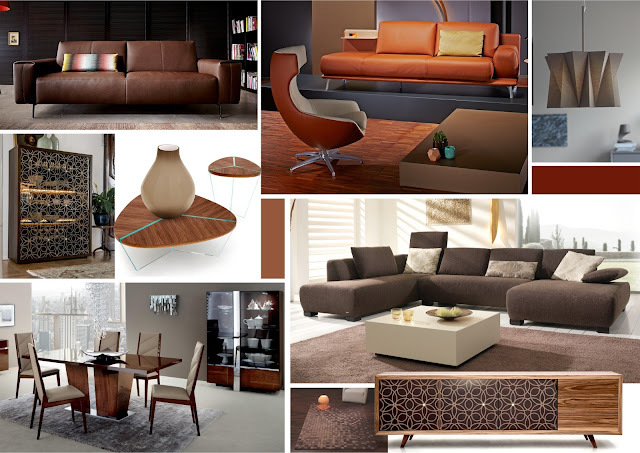 For lounge area, a plain rug with various weaves and textures and modern designs looks great. For children’s room bright-hued carpets with quirky designs should be introduced and placed between the study table and the bed. This will represent their persona. It is highly suggested to have carpet and the curtains in contrast shades to bring in positive vibes. 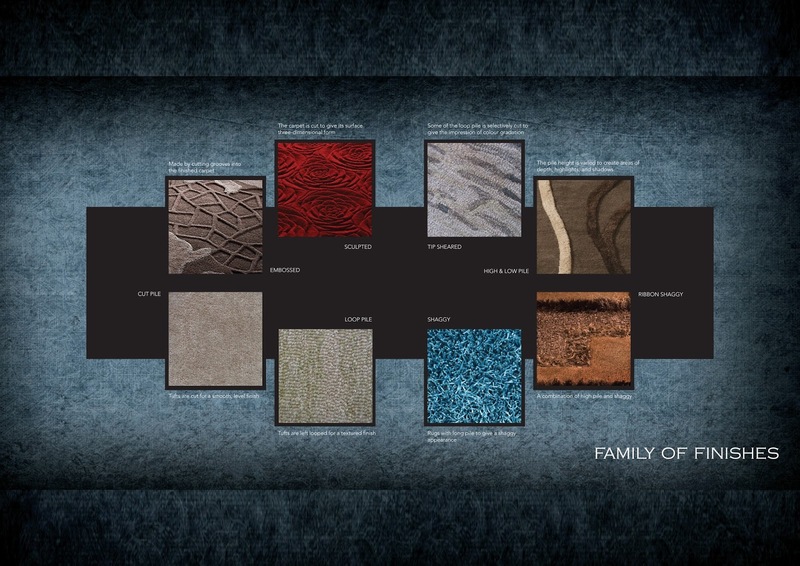 What role or function do you want your carpet to play? To brighten up a dark room or tone down a light space? For darker family rooms, living rooms and hallways, red is a perfect choice of colour. It wears well and tends not to show stains as badly as some of the lighter colors. Does the rug color match your personality? Casual, more-relaxed people tend to favor the warmer colors and earth tones. Detail-oriented people, on the other hand, often prefer blues, blacks, whites, grays and jewel tones. Do you feel more comfortable walking in rooms whose rugs are in one color family or the other? -Carpet quality is determined by a variety of factors including: the fiber type, the fiber construction, weight, density, and twist. The more fibers, the heavier the carpet; the heavier the carpet, the better. Density is important to the life of a carpet because it shows how many fibers are used in the pile and how close the fibers are tufted together. The rule of thumb is, the denser the carpet is the better quality it is. The type of fiber used determines the basic performance and appearance of the carpet. Every home is unique and requires different kinds of carpets to add the one element that makes it complete. Eventually, the carpet you choose will become the foundation of your fashion decor for each room you design. With the festival of lights just around the corner, now is a good time to brighten up your space, making it look a little extra-special. This guide offers some simple principles that will enhance the function and aesthetics of illumination around your home. Before we go in to the details, knowing some concepts about lighting will help in understanding why a type of light will suit a particular set up. There are four types of lighting: ambient, task, accent and decorative lighting. Proper layering of light can enhance colour and ambience. Layering involves the careful use of task, accent, decorative and ambient lighting within each room. Ambient lighting: General lighting that is not harsh but diffused and illuminates a room. It is the main source of light and is fundamental to a good lighting plan. Usually it emanates from hanging or recessed fixtures which include track lights, chandelier, pendants, wall sconces, wall light or suspension lights. Balance and adaptability are keys to a well-lit living space, which can be achieved through the correct use of ambient lighting. Also known as mood lighting, ambient lighting should be inconspicuous and blend into the surroundings. How to set up ambient lighting for your home: Make sure you use lights that cover all directions (Omni-directional) for instance pendants, chandeliers, ceiling or wall-mounted fixtures. These lights should light up just enough to give a soft glow to your space. It is not ideal for working closely with things or to highlight specific things around your space. If your ceiling is high, you can use chandeliers, pendants or similar lights and if it’s low, make sure not to use harsh lights. Suspension lights like Calligaris Dorado, Pom Pom or Cygnus are great to get the ambient look. You can use a combination of suspension lights, table lamp and floor lamp in different directions to get the ambient look. Downlights usually create a gloomy look because the ceiling appears dark and the floor is brightened up. If you’re using downlights make sure you fit lower wattage and more efficient bulbs. Task Lighting: This is lighting that helps you perform a task and look into details without any hindrance. It specifically illuminates the area of your work, whether for cooking, writing, reading or other similar everyday tasks. This type of lighting helps to stimulate your brain and induces concentration and alertness to perform the task at hand. 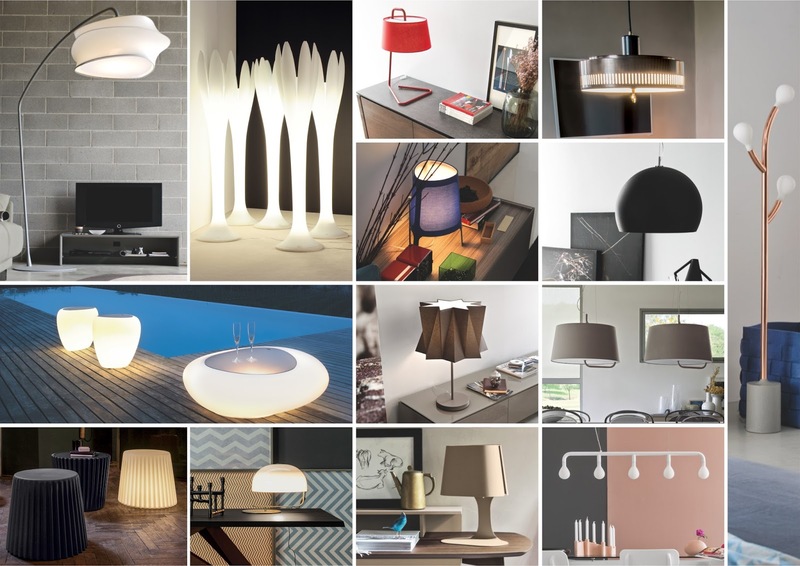 Some of the ideal task lights include desk, swing arm and floor lamps, under-cabinet and vanity lights, and pendants. Make sure these lights are free of distracting glare and shadows, but bright enough to prevent eye strain. How to set up Task lighting at your home: Directional lamps or downlights lamps are best employed for this purpose. Task lighting only works well when it is used as a contrasting light. For example, if you have a low lit room with a table lamp turned on, the light in that area will be more effective with fewer glares than if the entire room was lit with a brighter light. Use lamps on your console or side table, study table, bedside tables, coffee tables or anywhere you need a little extra light for working. Use cabinet lights in your kitchen and vanity lights for bathroom or dressing mirrors. Pendants too can be placed in a lot of areas and hang from work spaces. Similarly, table or desk lamps also highlight your furniture if it is kept next to a sofa or bed. A floor lamp next to a sofa is good example of task lighting for a reading area or work space. Use desk, table, and floor lamps in lounge, dining, and bedroom areas where the activity or furniture is likely to change positions. Use fixed, directional lighting where the setup is unlikely to change. Overhead fixtures should work in tandem with task lighting such as a floor lamp or lamp on a side table. Bonaldo Muffin lamp, XXLight and Calligaris Allure, and Lynx are the best examples to get the desired look. Accent lighting: This is mainly a concentrated light that intents to draw the eye to its focal point creating a visual interest. It highlights an object like painting, sculpture, or feature like the texture of the wall in the room. This type of light creates a very sophisticated atmosphere. Wall lights, recessed and spot lighting, landscape lighting, and table lamps are good examples of accent lighting that defines specific areas. Creating effective accent lighting typically requires at least three times as much light on the focal point as the general lighting around it. Accent lighting is usually created by using track, recessed, or wall-mounted fixtures. How to set up Accent lighting at your home: Using wall lights will highlight big or small pieces of art in your decor. Recessed or spot lighting can be used to highlight your art, paintings or wall designs. Table lamps can be used to highlight your furniture or any antique piece. Calligaris Pom Pom, Andromeda, Big Wave, and Phoenix help you achieve this look. If your living room does not have an overhead fixture for overall lighting, then using accent lights can make such a room work harder and smarter. This can include spotlights on indoor plants or artwork, or even a light behind a chair to brighten a dim corner. When you add this type of accent lighting, keep in mind that the effect of the light should focus on improving the atmosphere of the room and not make it opaque. The light source itself should seem almost invisible. Decorative lighting: it is treated as a design element to enhance your decor or space. It does not function just to illuminate a place but to make it look warm and welcoming. For instance, Tonin Casa Spiga light is a two-in-one functional piece that acts as a coat hanger as well as a floor lamp, to brighten up your corners. Bonaldo’s Eos is also a similar piece with the same function. How to set up Decorative lighting for your home: Use these lights at the corners of your room so that the details of your decor are seen with a naked eye. You can use these at your entrance too to create a welcoming and inviting environment that encourages people to linger. If your living space is wide and spacious, then a lot of lighting elements can be used to illuminate the room. On the other hand, for more compact spaces, are better served by fewer lighting elements. For high ceilings, you can use chandeliers and other bright lights. Low ceilings need suspension or low-key lights so that the light is not harsh. Use lighting close to a mirror as it will bounce into dark corners and brighten dead ends. In living rooms, use a combination of floor lamps, table lamps, and down- to help you achieve a variety of functions and activities in that space. Bedrooms should have good reading lights at the bed and desk, and a task light for getting dressed. Any overhead lighting should be fit with a dimmer. Use compact fluorescent light bulbs (CFLs) over fluorescent tubes, as the latter make everything look off-colour. Floor lamps and table lamps should be placed below your eye level. Floor lamps decorate your space with the luminous physicality of their oblong shapes while small table lamps dissipate the darkness and colour the environments. Use suspension lamps to light up a room, highlighting its surfaces, and to project their multi-faceted personality into the rooms. Use floor lamps to decorate and create points of light that, when arranged carefully, generate richly evocative atmospheres. Use versatile table lamps to draw attention to the surfaces and objects they illuminate. Add a dimmer. This allows you to easily change the mood and brightness of your lighting depending on the time of day. Incandescent bulbs produce a warm, yellow glow. Halogen light is clear and clean. Fluorescent light, which can be blue or full spectrum, creates a more modern appearance, and only needs to be changed every few years. Choose whichever you feel will give you a desired look by keeping certain rules in mind. Table lamps and floor lamps work well to complement existing overhead lighting by enhancing a corner that might normally be dim. The material and colour of your furniture can play a role in your decision to use warm or cool lights, since the variation of lighting colour can make room colours appear very vibrant or quite dull. Match the lamp’s colour temperature to the tones of your room. Warm colour temperatures render warm colours like reds, yellows and browns well; cool colour temperatures render cool colours like greys, greens and blues better. In rooms following these general rules, furnishings appear more vibrant. 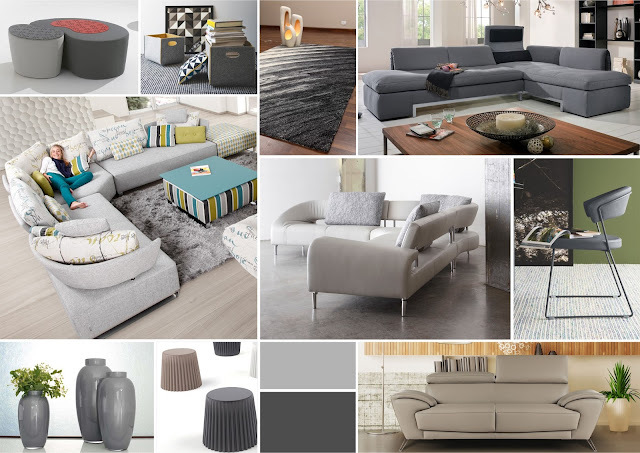 While in a living room, opt for a floor lamp next to a couch or your favourite reading chair. In dressing room and bathrooms, the lighting at the mirror should be free from shadows and glaring light. Design your lighting in such a way that you will not need lights turned on during daylight hours. Avoid over lighting your rooms. Create task or accent lighting with directional lighting. Create general lighting with non-directional lighting. Lighting is for ambiance, aesthetics, tasks, and seeing better in your home. Each room in your home should have a mood you want to set, as well as a function you want your lighting to serve. Eventually, creating a warm, welcoming room is easier with well-planned, well-placed lighting. Wishing you a happy festival of lights! Studies show that people spend more than half of their life span sitting. This is why sitting comfortably, and in a posture that’s good for your body, is important, whether you are at a dining table or on a sofa. Previously, in our guide on dining tables, we covered the importance of choosing the right dining table for a space, and how to do so. We didn’t touch up on the subject of dining chairs in any detail, simply because it’s a subject that deserves its own guide. Generally, most people relegate dining furniture to the bottom of their furniture shopping list – after they’ve attended to things for their living room. But the truth is, a lot of memories and connections are built around the dining table, when family and friends gather over good food and great conversation. This makes choosing the right dining furniture just as important, and the right dining chair, critical to the entire experience. Here are some insights that will be helpful while buying a dining chair. Space: First, you need to answer a few basic questions. How much space your dining room has, how many chairs can fit alongside your dining table, and how many people you routinely need to seat. These three factors determine half of the decisions in choosing the right chair. Start by taking measurements of your room and dining table (if you haven’t already chosen a table, then you should do that first) to see the size and number of chairs you can accommodate. Rectangular and round tables can accommodate more chairs than a square table. Keep in mind that you will need additional space to pull a chair back. Plan for a minimum of 44 inches between the wall and the dining chairs. More room means you can slide out easily. Ideally, take this measurement when you are actually sitting on the chair. 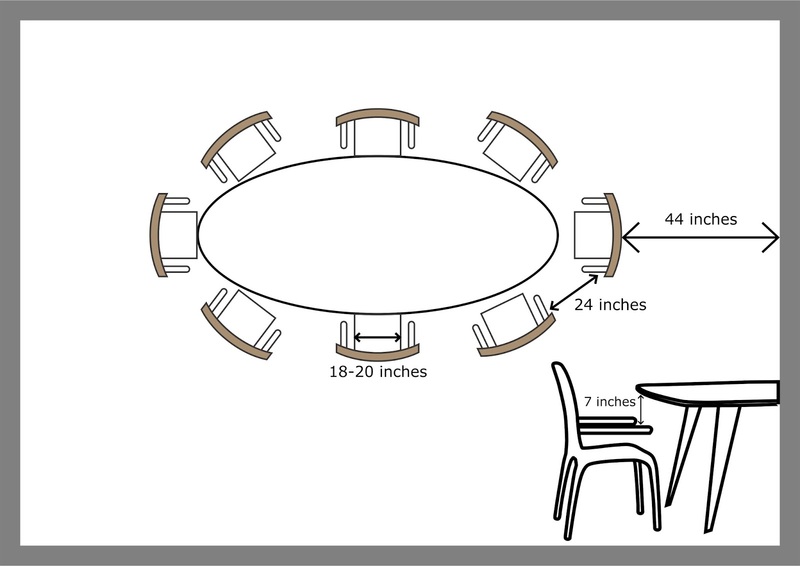 Note where the legs of your table are located and how many chairs will fit around them, if you allow 6 inches of space between each chair and the table legs. Consider the table top space too: the separation needed to avoid people bumping their elbows. Preferably, the chairs should be placed 2 feet (24inches) apart. Similarly, you need to take into account the height of the table top over your lap when seated, which should be at least 7 inches. Ensure that your legs are free from hindered movement. For those who are used to crossing their legs, you’ll need more space, say about 10 inches. Check that the chairs fit under the vertical rail that runs below the table top. For long conversations and leisurely meals, you need chairs that support your spine. 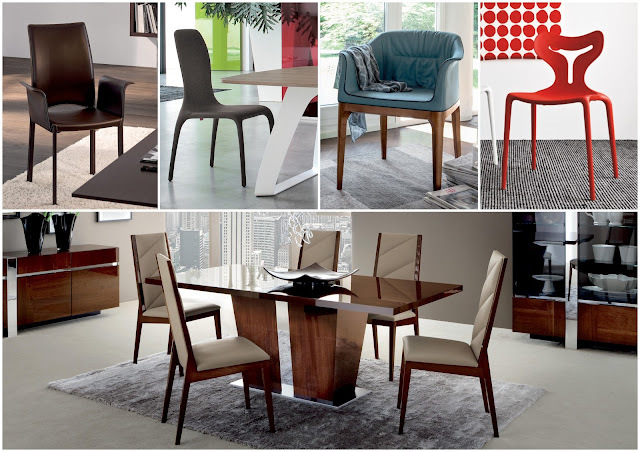 Upholstered chairs like ALF Ellis, Tonin Casa Mivida, and Calligaris Etoile are more suitable than a plain dining chair. You could also consider armchairs for this setup, like Calligaris Gossip, or ALF Siena or Capri chairs, as they support your arms. That said, armless dining chairs make your dining space look bigger. They occupy less space, visually as well as physically. Diningchairs don't always need to be at the table. For a versatile seating solution, stacking chairs allow for easy storage. If space isn’t a concern, you can consider high back chairs. For a formal look, dining chairs with a high back such as Tonin Casa Charm and ALF Eva are more appropriate. If you’re worried about spills, leather or fabric chairs are the most forgiving. Chairs like Koinor Berry Single offer a relaxed look and are also practical for a kitchen, especially for a home with children. For a traditional look, wood and metal chairs like Calligaris Chicago or Philadelphia, look apt, while moulded plastic chairs like Tonin Casa Charonne do well for a contemporary look. Unique designs such as those in Koinor’s Bellagio collection, offer both benches and round and square upholstered sofas to match a dining table shape. Benches are always a bonus as they provide maximum seats in minimal space. If you have guests often, this is a good option. With outdoor dining, you can bring great design and comfort outside. Outdoor chairs like Calligaris Area 51 and Hero come in various colours to suit both indoor as well as outdoor spaces. Material and finishes: Your chair’s material and finish reflects your dining room’s mood. Darker finishes look heavier, while light or pale colours bounce light around and help the space feel larger. Wooden chairs are preferred when you want a complete traditional or natural look. Wood is versatile and you can choose from a wide range of finishes and styles. Apart from wood, choosing upholstered chairs like Calligaris Latina and Juliet, will give you a wide option to choose colour and pattern for a better and rich effect. Parsons is a one-of-a-kind upholstered chair that suits all décor styles for instance Calligaris Bess or ALF Canova. Whether you want an upholstered or non-upholstered chair, it all depends on your lifestyle and family. It also gives a traditional look and adds glam to your dining space. Besides, contemporary chairs also include those of bent wood or molded plastic and metal. Coming to maintenance, leather is easy to maintain over fabric and velvet. But, if you prefer fabric, make sure you have removable cover for your chairs so that you can wash them whenever necessary. Comfort: It is hard to define what comfort means to each person as each individual has different comfort priorities. The basic rule is to test drive it by sitting, touching and feeling it. Check whether you can sit without feeling strain on any of your muscle, shoulder or spine. The chair seat should ideally be at least 45cm to 55cm wide. Also, you need to decide whether you want a soft seat or something hard and firm. Follow this checklist and it’ll be easy to pick out the chair that's best for you. The designs that took the limelight at this year’s iSalone del Mobile, also known as the Milan Furniture Fair, make their debut at SimplySofas showrooms across India. Being the benchmark event for furniture design in the world, iSalone defines and shapes the future of how we live. The Fair unveiled new materials, colour trends, pioneering designs, and innovation, presenting a host of creatively and exceptionally crafted models. These are now collectively available at our stores, representing the most awaited designs and trends in the world. The new collection is available to you at a same time as the global launch, meaning that when a stylish, handcrafted leather sofa makes its home in a living room in Milan, it could make its home in yours as well. The key participants at the Fair include NicolettiHome, Koinor, Fama, Calligaris, ALF, Tonin Casa, Leolux, and Bonaldo, through their latest creations that were showcased during the Fair. The 2016 Milan Collection comprises of sofas, chairs, recliners, armchairs, sectional sofas, dining tables, dining chairs and more. Quite aside from the remarkable workmanship and quality that these products deliver, you also take home the pride of owning a novel design admired by a conglomeration of the world’s leading designers, architects, and interior decor professionals. Highlights of the Fair were the colour and material trends that play an enormous role in determining the furniture trends at a global level. The designs displayed a fusion of colours ranging from marsala, blue, yellow ranging from golden yellow to deep yellow, dark orange, dark pink, purple, lemon green to chartreuse. These are quite evident in the latest 2016 MilanCollection. For instance, NicolettiHome displayed a new design, fancy, an orange sofa which is exclusively available in our stores. 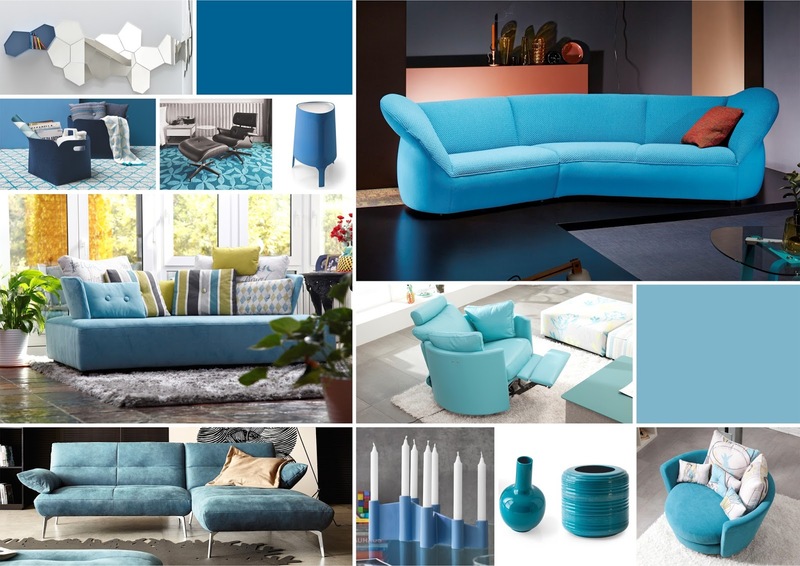 Some of the trend colours are also found in our latest collection of Fama and Koinor products. Likewise, material trends played a significant role. One of the major highlights this year was the smoked eucalyptus as the newly-favoured wood finish. Toned steel, marble, metal, wood, and glass were other combinations that enjoyed contemporary design expression on tabletops and in accessories. Spanning from classic ebony and oak, wood remained the favourite. 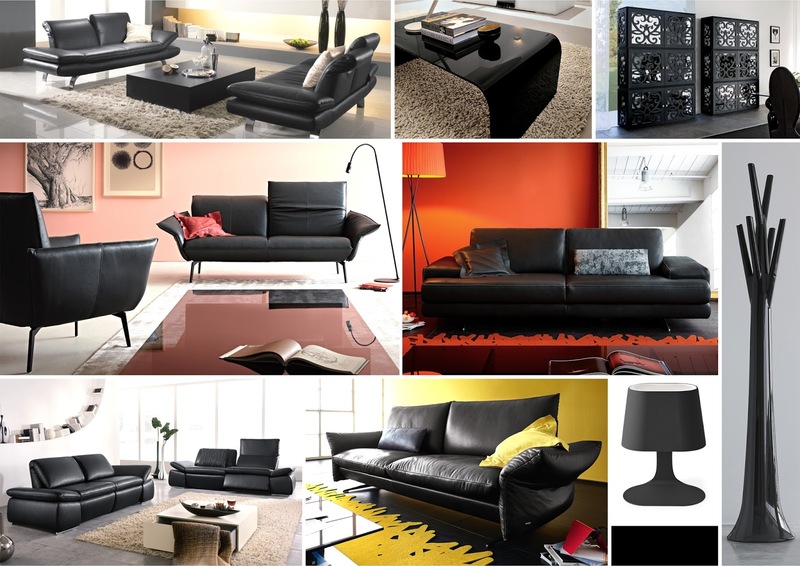 You’re sure to find these material and finishes in our brands like Calligaris, ALF, and Tonin Casa. One of the most innovative ideas in the Fair included the freedom to choose your personalized designs that can be custom-printed on fabric upholstery. 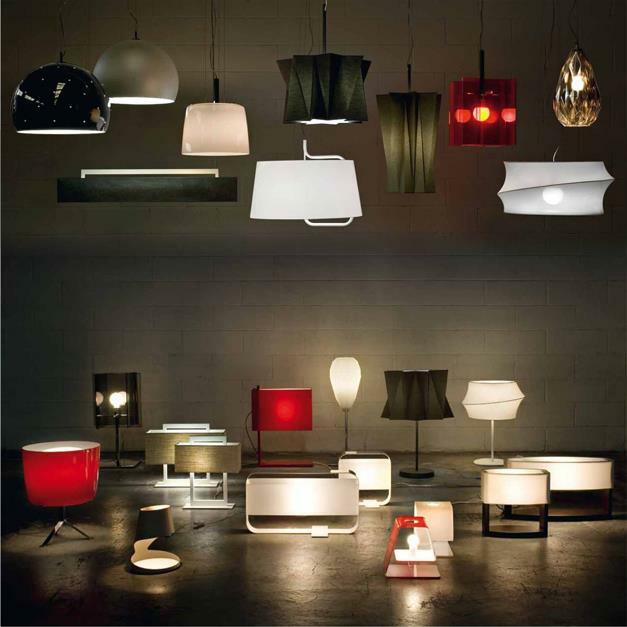 Fama’s ‘Helsinki’ was one of these products that was showcased in Milan, and right now displayed at our showrooms. Quite like getting the latest dress from the designer’s closet before the world has it, the feeling of owning the latest from the 2016 Milan Collection is purely for those who appreciate the value of exceptional design, craftsmanship, and enduring comfort. Visit us at our showrooms in Bangalore, Chennai, Coimbatore, Kochi and Pune to explore and experience the wide range and the latest trending collection from Milan. Also visit our website: http://simplysofas.in/milan2016 for more information.